'Rock The Kasbah' is the latest 'comedy' to hit the screens in the UK. It stars the legendary Bill Murray so you'd expect there to be some potential within the film. But would this film rock as the tittle would lead you to believe, or would it be a disappointment? 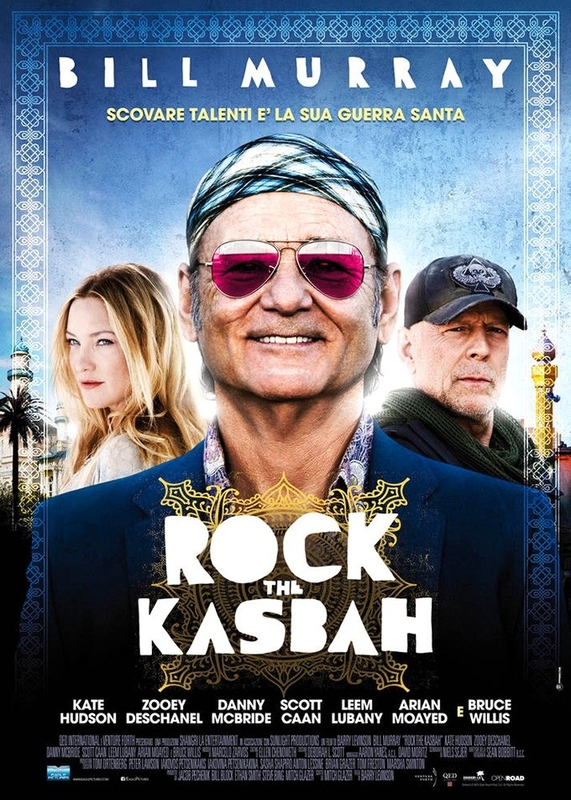 'Rock The Kasbah' follows Richie Lanz (Bill Murray) a has been rock manager who has handled many a tour during his time. He attempts to take one of his few clients to Afghanistan for a tour. After being deserted, he discovers the talent of a young Afghan woman who is forbidden by her family and faith to perform. Despite this, Lanz will work to turn her into a star. Oh boy. This film was just not good at all. What a massive waste of time. When you're sat watching a comedy you expect there to at least be a few moments that are actually funny. If it fails that you hope that it is at least entertaining. 'Rock The Kasbah' was neither of these two. When nobody at all in your screening laughs at least once through the entire film, you know there's a problem. The case for it not being interesting at all had me continuously looking at the time, just hoping that it would finally all be over. The funniest thing about the film happened once it had finished. Once the credits started to roll and the lights came on, whilst talking to my friend, I noticed that a fellow member of the audience was sleeping. This only confirmed that the film was a total borefest. The film is just so bleak and drab also. Every setting and scene is so lacking of life or spirit and it just makes it even worse to watch. Nothing will ever grab your attention or add more like to the film which it oh so desperately needs. Everything is just so boring and soulless. There really isn't anything in Rock The Kasbah that will excite you or get you eagarly anticipating the next step in the film. I guess this also helped put the member of the audience to sleep as well. The feeling of the film having no life also comes from the characters. Let's just hope Bill Murray is a lot better in his upcoming projects such as Ghostbusters and The Jungle Book. It was sad seeing him in this monstrosity. Bruce Willis was again not very good which seems to have become common for him to do nowadays. Zooey Deschanel was awful in this and I'm so glad she wasn't apparent throughout the entire film. There really isn't any notable performances in the film. I guess some aren't completely terrible like Kate Hudson but that's really how far it goes. The characters never really progress and just overall aren't interesting at all. I guess one redeeming factor of the film is how it shows the struggle of the young Afghan girl. All she wants to do is to be able to sing but is constantly put down by her family and the public. It is pretty shocking to see the lack of support Salima gets all due to just being a woman. The way she is forced to be hidden away from the world after performing and how she even could of faced death due to it. The film does deserve some credit for this as it did do a good job at showing the very tough and harsh situation she was a part of. There's also a lot of parts in this film that are just puzzling. Like why does every single shop in Afghanistan have a fully functioning TV facing the street? Where did Bill Murray get to print off hundreds of thousands of coloured leaflets to hand out and also drop from a helicopter? How come Salima gets better TV service in a secluded cave- which I don't know how it has electricity- than I do in suburban Scotland? At lot of things just don't make sense and really hurts the film even more. Not that it needed it really. A forgettable, unfunny and not entertaining comedy. You really don't need to see this film which seems like not a lot of people have. In its US release it grossed under $3,000,000 making a fifth of its overall budget. Yikes. So have you seen Rock The Kasbah? If so what did you think? Although I don't recommened you see it, if you do go I hope you enjoy it more than me and the fellow audience members did. Once again thank you for reading, it is much appreciated!